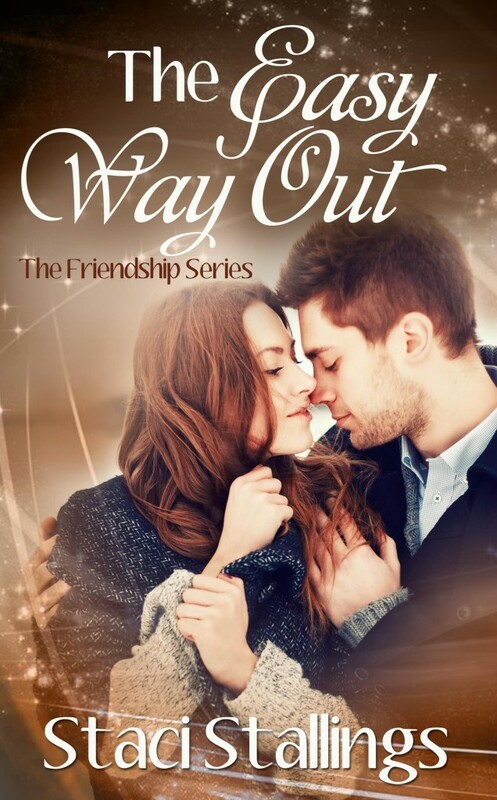 “The Easy Way Out” by Staci Stallings is the second book of the Friendship Series. It picks up where “Eternity” left off. It would be a good idea to read the books in order, but the author does a fairly good job of working enough backstory or history into the second book that it could be enjoyed on its own. The biggest reason to read “Eternity” first is because this is the same situation seen through a second set of eyes. Brothers and sisters don’t have the same relationship with their parents because they are different people. “Eternity” shows Harmony’s relationship with her parents as being a good, supportive relationship. Her sister, Charity, sees the family as dysfunctional and unsupportive. Charity sees Harmony as the favorite daughter, and herself as a screw up, not worth loving, never getting a break, and doomed to eternal criticism no matter what she does. 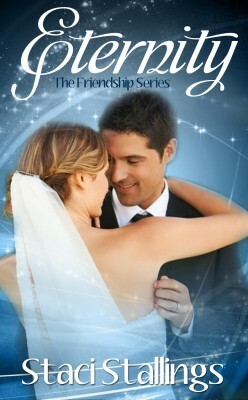 The story begins as Aaron and Harmony are getting married in a big, church wedding. Drew, his former roommate, business partner and best man, steps outside for a quick nip on the bottle. He is quickly joined by Charity, Harmony’s little sister and Maid of Honor. They compare notes on marriage, and agree that it just isn’t right for either of them. Both of them think their parents made mistakes with their marriages, and afraid of making the same mistakes themselves, they have decided to avoid the whole issue. They start to offer each other the support they aren’t getting from either of their families. That support leads to friendship, and a promise that they will never take the easy way out. Then the situation gets sticky, and it becomes a real challenge to keep that promise. While “Eternity” was a story about good people caring about each other, “The Easy Way Out” is a story about a hero and heroine who have lots of flaws. They make poor choices, have bad habits, run away from their problems, and finally have to learn to face a challenge, accept responsibility and learn to forgive. The plot has a lot of twists and turns that keep it engaging. And while the characters aren’t perfect, the author still makes you care about them, and shows that God cares about them as well.